This recipe is an old family recipe that comes from a close friend&apos;s family, the Quartano family, in New Orleans. I had it at my friend&apos;s house and it is amazing. It is a great alternative to stuffed artichokes New Orleans style. 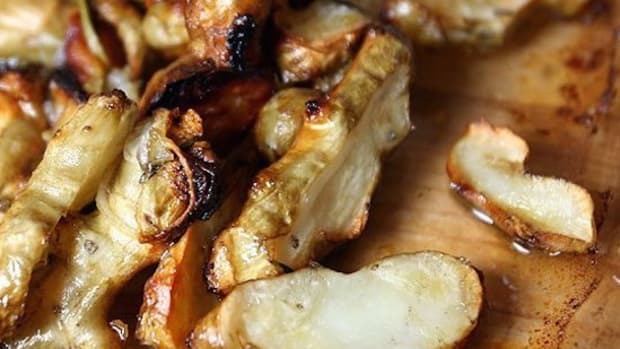 When cooked properly these artichokes do not need any accompanying dipping sauce. 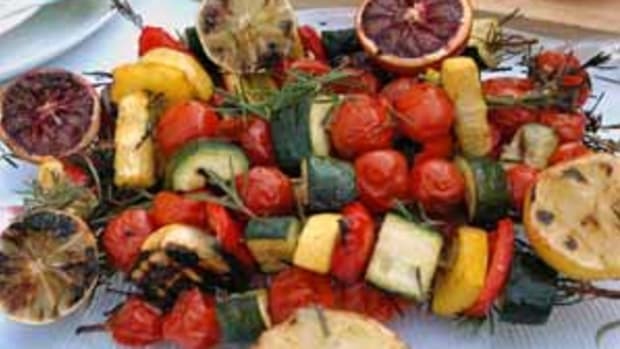 The olive oil and herbs add enough wonderful fresh flavors. When dealing with homegrown artichokes, take the artichoke by the stem, holding it upside down, and tap it against your kitchen sink a few times. This will remove any unwanted critters that happen to be living in your artichokes such as earwigs. 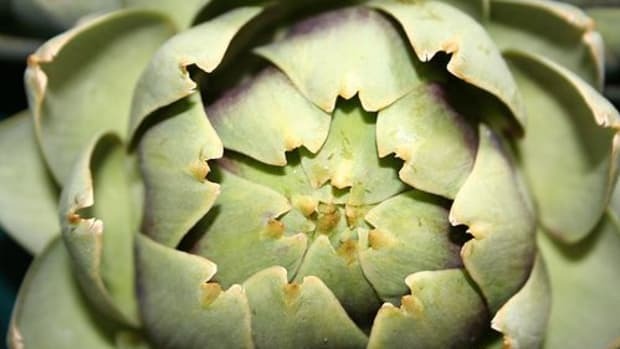 With any artichoke, wash it inside and out under running water, pulling back and spreading the artichoke leaves to thoroughly rinse the artichoke clean. Cut the stem from the base of the artichoke. This will give you a nice flat surface with which to work. You can trim and peel the stem (about 1/8 inch) so the stringy part of the stem is removed and only the center part is left. 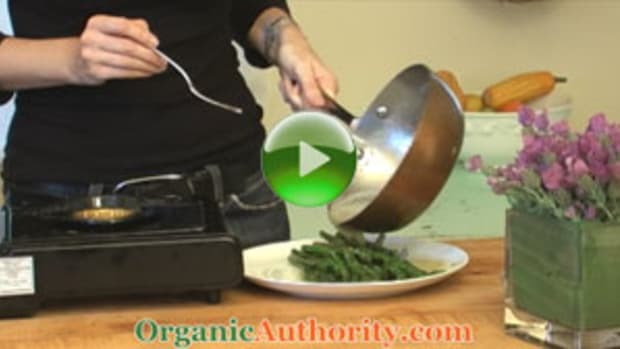 You can then cook the stems with your artichokes. Next, pull away the bottom layer of leaves from the artichoke. Then trim the bottom of the artichoke with a pairing knife removing any fibrous pieces thus leaving behind a nice semi-smooth base. With a large chef&apos;s knife, cut off about a 1/2" of the top of the artichoke leaves removing the tips of the leaves. Next use a pair of scissors and trim away the remaining thistles on the leaves. You should now have a nice even top with trimmed leaves. 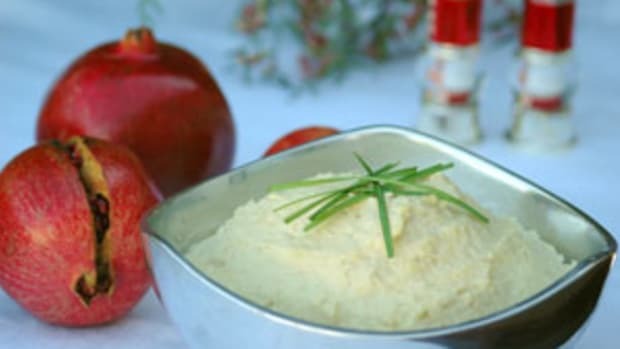 Trimmed artichokes should then be placed in a bowl of acidulated water - water with the juice of one or two lemons - until you are ready to cook them. Place artichokes in a Dutch oven. Fill Dutch oven with filtered water about 3 inches high, about half way up the side of the artichokes. Add stems - they can be totally submerged in the water. Generously pour 1/2 cup of olive oil divided over each artichoke. 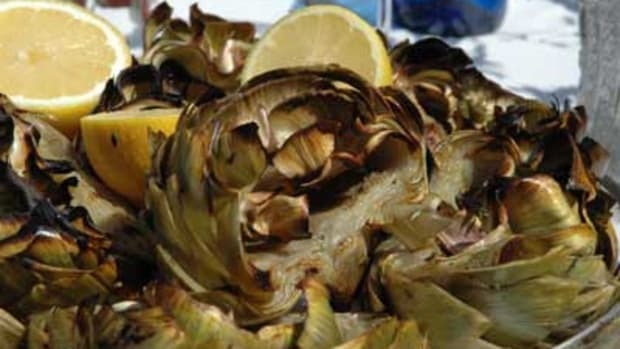 Generously sprinkle dry Italian herbs over each artichoke - the artichokes should look like they are covered in dry herbs. Follow with garlic powder, again generously cover the artichokes. Generously salt & pepper each artichoke to taste. 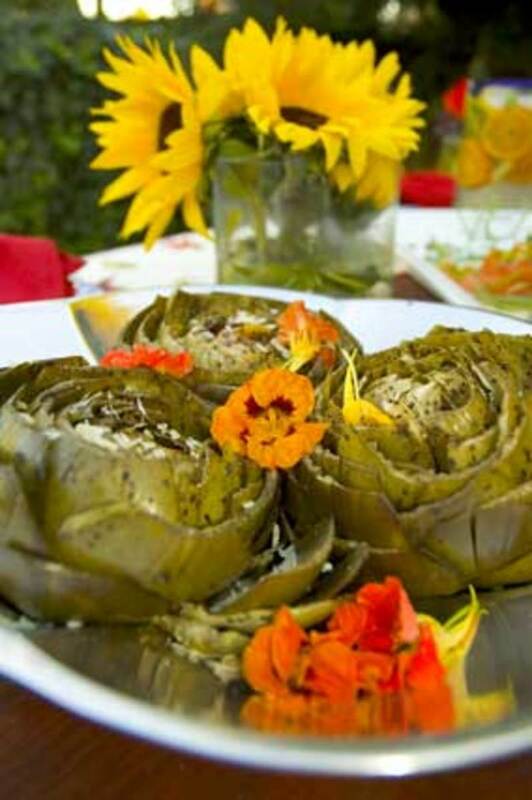 Drizzle artichokes with remaining two tablespoons of olive oil inside each artichoke. Bring water in Dutch oven to a boil and then let simmer covered for 1 hour and 30 minutes to 1 hour and 45 minutes until tender. Artichokes are done when tender and falling apart. Grate fresh pecorino over top of artichokes and serve warm or hot.